Parks And Recreation: "The Set Up"
Even though comedy is often born out of conflict, the best comedies come about when its characters a) genuinely like each other, and b) get along for the most part. The strange alchemy born from very different characters finally finding ways to work together makes for a much more stable premise to base a show around. The major difference between season one and season two of this show is that in season one, the characters acted in silos next to one another. Now Ron and April are forming this weird alliance, April is finding herself attracted to Andy, Leslie's shenanigans are not only tolerated but embraced, and even Ann and Andy are on ridiculously good (and silly) terms. It's a hell of a lot more fun this way. It also says volumes about the writing staff of Parks & Rec that they didn't stray far from the already established characters to make it happen. During the whole "Ron needs an assistant" subplot—the cause of which reminded me a lot of that season one West Wing episode "The Crackpots And These Women"—I found myself thinking, "Of course Tom, the desperately insecure one, would volunteer to help because he's in such need of a friend; of course he would disappoint Ron who'd make him feel like a failure all over again; of course April is the perfect choice, her deep understanding of apathy complementing Ron's desire to do nothing." That's not to say the show is predictable, or that any of this is a bad thing; it's just that when writing on a comedy TV show is really good, the characters do somewhat unexpected things yet it makes total sense (especially when accompanied by lines like, "Find me the opposite of him"). Of course, a little surprise hits even harder when all the rest of the pieces fit—I still count Andy showing up to Ann's house naked as the show's laugh-out-loudiest moment—and tonight's episode felt a little too plot driven to ascend to A-material heights, particularly the A-story about Ann cockblocking Leslie from true love Justin with a sham Will Arnett date. (Ann's so hung up on Justin, she doesn't even intorduce Mark as her boyfriend. Low!) Though the main story had its moments: It was nice to give Rashida Jones more to play with than "just be supportive," and her weirdness over talking about Justin made for some wonderfully uncomfortable moments with Mark, Andy, and Leslie (who mined it for all it was worth). 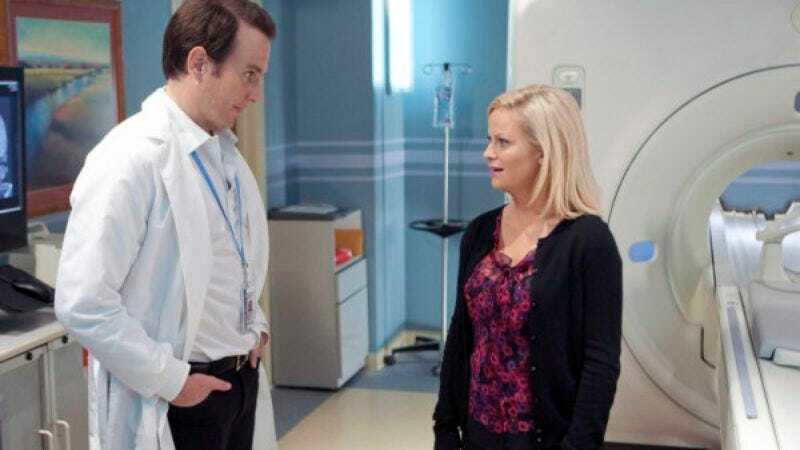 And while Will Arnett/Amy Poehler wasn't as magical as Megan Mullaly/Nick Offerman, that first real-life married couple brought a subtler repartee to the dialogue, which mostly consisted of Will Arnett taking jabs at Leslie. Arnett so often plays over-the-top like Gob Bluth, but hearing him sneer things like "Wish she'd told me you went to Indiana" under his breath gave me a glimpse into the softer dickishness of his characters, and I liked how it escalated to him using the MRI as a way to be macho, wondering aloud if Leslie was on her period even though it didn't matter for the MRI (not so subtle hint), then ending with "Get your MRI and get out, huh? I should have noticed you were missing a heart." Arnett starting at a 2 and ending on a 10 is just as fun as watching him hover around 8 or 9 all the time. I've also gotta hand it to Chris Pratt, whose character, despite not having a direct hand in the course of the show, has found ways to turn his few scenes into comic gold. His version of Andy actually benefits from being on the sidelines, as it gives him more of a reason to shut himself off of the world and drive himself nuts, quietly pining away for Ann. Hence we get genius moments like his song about writing a song about doing what he's doing (which is turning what he's doing into a song), his crazy-eyed enthusiasm over April's suggestion to sell his CDs at the shoe shine stand, and, in a rare moment of compassion, his heartfelt plea with Ann to give it up with Justin already. Even after being dumped, Andy still cares, and Ann cares for him. Aren't things better when everyone gets along? Of course, he follows it up by claiming he dumped her, tries to trick her into not mentioning she's dating Mark, then when he fails claims he was "dead close" to, um, breaking them up I suppose. 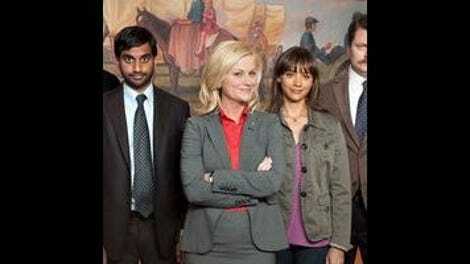 It's weird, but this is Parks & Rec, after all. "I made this in your pottery class. It's terrible!" Leslie still has a huge picture of Dave in her office. Sweet. "He'd have the brains of George Clooney and the body of Joe Biden." "I don't want to date a twin. I've been tricked before." Shout out to my boy Roddy B! "It's fast, smooth, handsome rock."